A breathless derby day comes to an end. Wins for Arsenal, Chelsea and Liverpool, but that only tells some of the story. Catch up on any reports and reaction you may have missed here, and join us on Tuesday and Wednesday for a full programme of Premier League fixtures! Jordan Pickford got his angles wrong, he misjudged it. He should have tipped it over the bar, pushed it out for a corner and dealt with that. It's just an error of judgement from him. Everton manager Marco Silva tells Sky Sports what he said to his players in the dressing room: "That we didn't deserve it, that I was proud of them. Like we started the game altogether, we finish the game altogether. The draw would have been a fair result." Has he ever seen anything like the winning goal before? "It is the first time but football gives us new things every day." Could Pickford have done anything differently? "We will analyse the moment with Jordan, it was a bad moment for him. But I told him he has done many amazing things. It was a lucky day for Liverpool." On Jurgen Klopp's celebration: "I didn't see Klopp's reaction and if we scored that goal and been so lucky I might have done the same. I didn't see any disrespect. "Their fans might have expected another easy match but their celebrations at the end showed they got something different." Liverpool goalscorer Divock Origi speaking to BBC Radio 5 live: "It's an unbelievable feeling to win a derby, and for the Liverpool supporters as a club, we feel proud. "I was happy I could rectify my error from the beginning. It's difficult as a player whenever you make a mistake. Jordan Pickford seems like a very good keeper and, mentality-wise, he seems like a good lad so he'll learn from this. "We have a passionate coach, a passionate club and passionate players. Sometimes emotions can take over and, in the end, you can't hide happiness." Did Marco Silva find Jurgen Klopp's celebrations disrespectful? In true Arsene Wenger style, he 'did not see the incident'. Everton manager Marco Silva speaking to Match of the Day: "It was a tough match and a tough result for us. We don't deserve to lose. "We challenged them to win the match. I think the draw possibly was the fair result. They didn't deserve it but that is football. It is our life. It is something different every day. That goal you cannot expect to happen. "They [my players] understand they deserved something more. We started the match together and that is how we end it. We will be in this way and do everything to win the next match. All the support I can give to Jordan [Pickford] I will. He is a very good goalkeeper. He did not expect that situation. "I can't think of the chances in my mind at the moment but we had many, many chances. We had the better chances to score. They had two or three too but we had clearer chances to score. When you perform like we performed this afternoon you will win matches. "We are improving and we did again this afternoon even if the result wasn't what we wanted or deserved. I am proud of my players and what they are doing. They are working really hard and showed how we are growing. Nobody in the stadium expected that moment. The way they celebrated it showed to me how difficult it was for them." 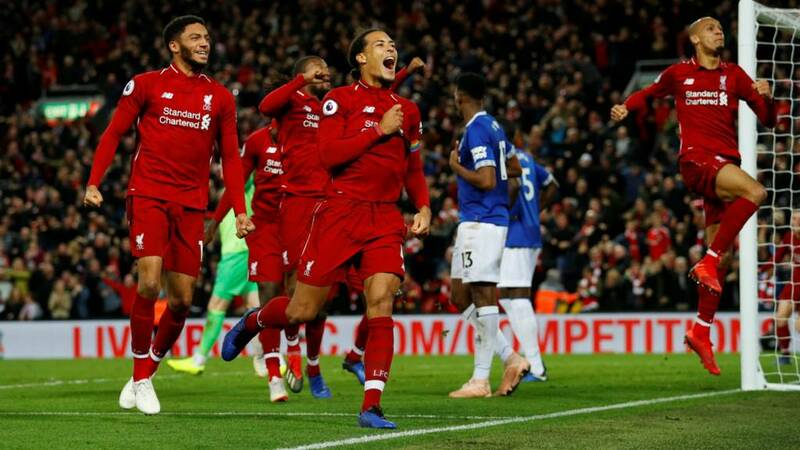 Liverpool manager Jurgen Klopp, speaking to BBC Sport, on whether he had seen anything like the winning goal: "Not often, it happens from time to time but not very often. Thankfully because it is better for the heart if football games are decided earlier. "First of all I have to apologise for my run. I apologised immediately after to Marco Silva, I didn't want to be disrespectful. You can't enter the pitch as a manager. You know the laws, you can't do that. It's unacceptable. Players aren't allowed to leave the pitch and incite the fans. Players take their shirt off - after the Leicester incident - and get booked for that, and rightly so. No matter what the occasion, you can't do it. It's great to see passion and emotion, I get all that, I don't have any issue with celebrating in the technical area or with the people on the bench, but to run on to the pitch, what if that had caused a massive melee? If Marco Silva had done it there would have been fans on the pitch trying to get to him. And that's where the problem comes. You can't just say 'it's at Anfield, it's the home manager, that's acceptable'. Everton play Newcastle at home on Wednesday, while Liverpool travel to Burnley. Everton defender Michael Keane: "Everyone is devastated and silent. We are consoling Jordan [Pickford]. He got unlucky. He has been brilliant for us. Everyone is devastated because of the work we put in. We had our chances and came close. We are devastated for ourselves and the fans. "We went to a top team away from home and conceded late. If we keep playing like that and keep enjoying our football then we will get a win soon. "We have proved we are capable of matching any team on our day. That is the positive we have to take. We have another game on Wednesday so need to get over this and make sure we are ready to get the win." Liverpool goalscorer Divock Origi speaking to Match of the Day: "It is definitely one of the most crucial moments I have scored. You could see the emotions. I am very happy of course! "I tried to be ready. There was a lot of scuffles so I knew I had to be ready. I had a tap-in so it was good! I tried to use every good and bad moments. "Those bad moments form you as a player. I try to play my game and enjoy it. Today it has paid off. Scoring as a striker is one of the most beautiful feelings. "And in a derby it makes it even more special. It is a crucial three points for the team so we just have to keep going like this." I don't think Danny Mills is a fan of Jurgen Klopp's celebrations, do you? He'd be lucky not to be running past me if I was playing in that game! But that's the sort of problems it can cause. There are so many managers that get absolutely hammered but Klopp is very media friendly, everybody seems to love him and he can't do anything wrong. Pep Guardiola sometimes gets away with it a bit more. I just think it's completely wrong. You cannot go on to the middle of the pitch, no matter what the circumstances. Liverpool have conceded just five goals in their first 14 Premier League games this season; only Chelsea in 2008-09 conceded fewer at this stage in a PL campaign (4 goals). More from Jurgen Klopp speaking to Sky Sports: "It is such a nice story that Divock Origi can score a goal. It is a horrible injury he got in another derby and it was a big break in his career. Now he is back fully fit and can come in and score this goal. It is really cool." On Virgil van Dijk's strange assist: "The situation was finished for me when it left his foot but then I saw it spinning and it fell. We were there. It's good!" On the title chase: "If you drop points that is how it is. Nobody thought about the situation in the title. We only wanted to win that game. It was really good intensity. Everton were really good in the build-up but we killed it a little bit. "This Everton team is good. To outplay them is not easy. I don't know how the ball is not in in the first half. It was a proper fight and from our point of view... a Liverpool win."